Earlier this week, Visit Herefordshire (visitherefordshire.co.uk) organised a forum for local tourism businesses and organisations. I gave a presentation to the group on Sustainable Tourism. If you’d like to know about our sustainable tourism audit and other ways we could help your tourism business, please call me on 07904 389889 or email me on julia@questforfuturesolutions.co.uk. After an interesting morning, Robert from Old King St Llama Farm (oldkingstreetfarm.co.uk) had a go of throwing a pot with help from our hosts, Eastnor Pottery (eastnorpottery.co.uk). 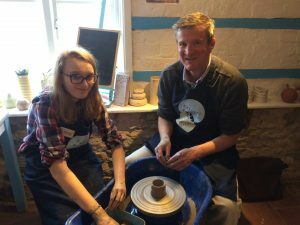 I was really impressed with the quality of the pots that everyone was throwing – visiting the pottery could be a really good family or team-building day out. Why not give it a go? Is your organization moving waste without a waste carrier’s licence? The government has just charged an unlicensed waste carrier £965 for driving a tipper truck full of waste without a waste carriers licence. Do you want to take the chance that you could be next? Anyone carrying waste needs to hold a waste carriers licence or be employed by an organization that does. This includes the transfer of waste between your own sites. It takes about 5 minutes to apply for a licence and if you’re moving your own waste, it’s free. If you’re transporting someone else’s waste, it costs £154. You also have a duty of care to ensure that your organization’s waste is being carried by someone with a licence. It’s easy to check the public registers – and worth making a diary note to periodically check that your waste carrier’s licence remains valid. I was with an organization this week, working through all of the environmental risks we had identified and scoring them according to the organization’s newly defined criteria. The criteria cover a wide range of potential issues, including safety, health & environmental; reputation; impact on operations and cost. As you might expect, some of the risks that are significant from an environmental point of view didn’t necessarily score highly in terms of the organization’s perception of overall risk. Also, some of the actions that we can take to significantly reduce environmental risk won’t reduce the risk rating at all because of the way it is scored. However, this was still a really useful exercise. It clearly highlighted those areas where our proposed actions would make a significant difference to the organization’s perception of overall risk, and some of these are areas where we have struggled to get senior management support for projects in the past. I am optimistic that this exercise will enable us to gain financial support for some really interesting projects that will generate significant environmental improvements as well as reducing risk for the organization. What are your senior management team’s priorities with regard to risk, and how can you use that information to make environmental performance improvements? Are your storage tanks in good condition? As part of your assessment of risks and opportunities in your organization, have you considered the risk of failure of storage tanks? Yorkshire Water has just been fined £600,000 for a leak from one of their sewage storage tanks. How often do you check the integrity of your storage tanks and associated pipework?